Starting with the real life case of Douglas Twiddy, Ian Howie introduces Pay Per Click (PPC) advertising with a checklist for PPC success. "They said Douglas Twiddy was crazy when he launched his holiday company, but when bookings increased by 50%…"
Duck is a sleepy town on the Outer Banks of North Carolina and when Douglas Twiddy started his holiday home rental business there, nobody had heard of the place. Duck is now a big tourist resort and Twiddy’s advertising has shifted from traditional brochures to Google Adwords Pay Per Click (PPC) advertising. The Twiddys haven’t abandoned brochures or print advertising but PPC is now their number one marketing channel. “Other advertising methods haven’t produced results like AdWords,” says Ross. And from 2006 to 2007 online bookings increased by 47%. People are searching on Google right now for your products and services. PPC offers you a fast and flexible way to reach those potential customers. But PPC is no magic bullet - you must constantly monitor, measure, and tweak your PPC campaigns to make sure they are profitable. Google’s PPC ads are essentially a real-time auction in which you bid on searches with the keywords you want your ad to appear for. When a keyword you are bidding on is searched with, yours and competing companies’ adverts are displayed in the 'Ads' positions. The order of that display – the ranking – is decided by who bids the most and who has the ad copy and landing page most relevant to the keyword being searched with. When your ad is clicked on you pay the amount you bid. For example, the Twiddys might bid $1.50 on keywords like ‘north Carolina vacations’ and ‘vacation rentals north Carolina’. If 100 people clicked on their ads following relevant searches then they would pay Google $150 (100 x 1.50). Be seen - your brand and advertising copy can be seen for any audience you choose to target. Deliver almost instant traffic to your website. Get qualified leads – your ads only appear in front of searchers using relevant keywords that you have chosen. A much higher (and more immediate) Return On Investment (ROI) than traditional advertising methods. Limit your daily budget to as little as you want. Add, change and delete the keywords you bid on and the ad copy you display. Test the profitability of different keywords and ad copy. Target different languages, regions and cities in most countries. To create your Google AdWords account, visit the AdWords homepage and follow the sign-up wizard which will walk you through the process. Set your budget’s daily limit. This is the most you can spend in any one day. Start with a small amount and then you can bid with confidence until you’ve learned how to make a profit. Use Wordtracker to carefully choose the keywords you bid on. Your keywords are the heart of your campaign and Wordtracker shows you real words searched with by real people. Segment your keywords into different Ad Groups so that they can each have different bids, ad copy and landing pages. Write different adverts and test them against each other. And never stop testing – always trying to beat your best performing ads. What have you got that your competitors have not? What’s your Unique Selling Point (USP)? Use your USP in your ad copy to make your ad more appealing and increase your clicks. The higher your click rate, the higher up Google’s pages your ad will appear. Learn about Google’s different match bids and use exact match and broad match. With exact match you bid on specific keywords only. With broad match you bid on all keywords containing the word you are bidding on. Introduce negative keywords into your campaign. Your ad will not show for any searches containing the negative keywords you bid on. Make sure your ad copy and landing pages all use the keywords they serve. Do this and your ads can move higher up Google’s results pages without the need to increase bids – that means less cost and more profit. Geo-target your ads. 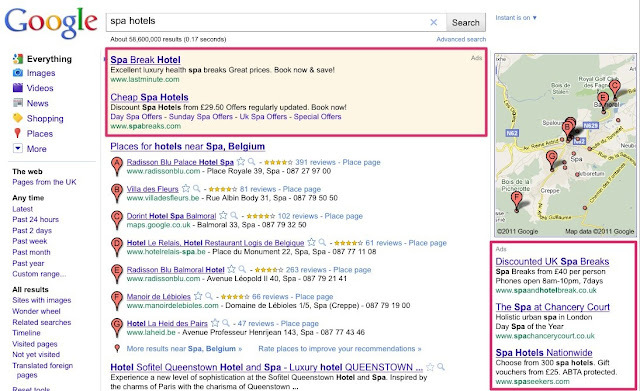 Make sure your ads only appear for searchers in regions that you can sell to. Limit your ads to display only during times of the day relevant to your company and products. Measure your results using Google Analytics or Yahoo’s Index Tools and learn what works and what doesn’t, always chasing a higher return for your investment. Pay Per Click (PPC) can bring you instant traffic and results. But beware! If you don't know what you're doing, PPC can take all your money for little return.